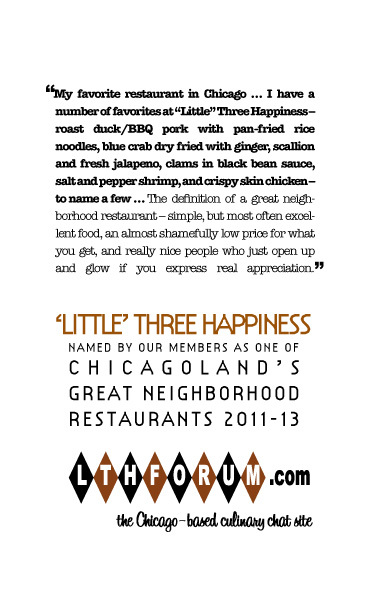 It's my honor to submit 'Little' Three Happiness, my favorite restaurant restaurant in Chicago, and the inspiration for LTHForum, as the first LTHForum.com Great neighborhood restaurant nominee. 'Little' Three Happiness is a pleasant and hospitable restaurant to which I have been going for over 20-years, and have dined well over 100 times. In addition to my experience 'Little' Three Happiness has also hosted numerous dinners for LTHForum members, friends and acquaintances. 'Little' Three Happiness has a number of strengths, including, but not limited to, seafood, noodle preparations and poultry. Perennial favorites are Salt and Pepper Shrimp, crisp pan-fried rice noodle with roast duck and BBQ pork, Crispy skin chicken and Blue Crab stir-fried with ginger and scallion. The virtues of 'Little' Three Happiness have been discussed in a number of LTHForum threads, the following, starting with one of my own, are but a few. Just to keep things on an even keel, there have also been a lukewarm post or two. Thank you in advance for your consideration, please feel free to request 'Gary's' Chili Oil which I keep at 'Little' Three Happiness for both mine, and friends, enjoyment. I have been enjoying LTH for the better part of 20 years as well. At one point, and for quite a few of those years, a big plate of noodles at LTH was my preferred Chinatown repast. Since then I have discovered other places, and moved on to other favorites, but I still continue to have delightful meals there from time to time, particularly with my engaging LTH brethren. In many ways, and speaking solely for myself, "Little" Three Happiness is the definiton of a great neighborhood restaurant - simple, but most often excellent food prepared and presented by the owners; an almost shamefully low price for what you get; and really nice people who just open up and glow if you express real appreciation and interest in what they are doing. LTH is also a good example of the kind of place where our plaque in the window can make a real difference in helping someone strolling about a neighborhood choose a good place over a not so good place. As the author of the above-described "lukewarm" post, let me strongly second, or third, or whatever we're up to, this nomination. I've since mastered the noodles and sometime soon I'll be up to asking for the magic chili oil. But LTH does many things very well, and some (the smelt, have I ever mentioned the smelt) are beyond superb. A worthy candidate. LTH gets posted about regularly and I eat there even more often that that. This place should be a slam dunk for renewal. Besides, Gary would literally be in tears if this place didn't get renewed. stevez wrote: LTH gets posted about regularly and I eat there even more often that that. This place should be a slam dunk for renewal. Besides, Gary would literally be in tears if this place didn't get renewed. Not sure about tears, though if 'Little' Three Happiness was not renewed LTHForum would cease to exist. Man -- I've just got to get to this place someday. If a "confirmation" outing is planned, I'd like to know about it. but LTH is wonderful, and I will go anytime with you- just say the word. On my recent visit with Sparky and Mr. White-Rice-With-Soy-Sauce, I was explaining that it was a little restaurant run by an actual Chinese Grandma - and was able to point out the Chinese Grandma, who eventually brought our food to us! I'm pretty certain there were at least 3 generations of family behind the counter on that busy Saturday. One of the nice things about LTH - you don't need someone to hold your hand. While I wouldn't order AmeriChinese food here (so I can't speak to it) I've had good luck playing dim-sum-menu roulette, which is how I wound up with the silver needle noodles I enjoyed so much last time. At the risk of being redundant, it makes a great GNR. Recent posts on LTH here, here, here and here. 'Little' Three Happiness holds a special place in my life, birthday celebrations, recurring request from visiting friends and family, conversation filled lunches, quiet dinner with my wife, jovial multi-course dinner extravaganzas, even the occasional 3am late night meal. Its one of the places I am happiest in life, my sunshine filled sandy beach in Fiji. Over the years I have developed favorites, 'L'TH must haves if you will. - -Shrimp Toast, culinary cliche, sure, but I love the stuff and LTH makes a particularly good version. - Pan fried rice noodle with roast duck and BBQ pork, light sauce, extra crisp noodle roast duck succulent fragrant with 5-spice, pork perfect compliment to duck. - Salt and pepper shrimp, shell/head-on with ginger, scallion and jalapeno. Shell and head are crunchy, edible and delicious. -Dry stir-fried crab with ginger and scallion, meaty blue crab stir fried with ginger, scallion and hot peppers. Bonus points when crab backs are filled with lovely red roe. -Crispy skin chicken, with cilantro, lemon wedges and a Sichuan pepper salt mix for dredging. This is incredible chicken, no breading, very crisp skin, with a juicy flavorful interior. -Ong Choi stir fried with Fu Ye (Water spinach stir fried with fermented tofu) Fermented tofu funk counterpoint to greens. - Clams Evil Ronnie Style, Clams with black bean sauce, light sauce, extra jalapeno, resting on a bed of crisp thin noodle. Named after and invented by our very own Evil Ronnie. 'Little' Three Happiness, the namesake of LTHForum, may just be the perfect restaurant,* long hours, open 20+ hour a day, moderate prices, friendly, in a reserved fashion, delicious well prepared food that has brought me to their table more times than I can count. I strongly support GNR renewal. *I just can't help but slip into hyperbole when talking about 'Little' Three Happiness. I loved the effervescence of this post and feel the same way, which is why I support renewal of LTH (within LTH). I get a different excitement about introducing and guiding people through this modest storefront than I do LSC, Spring World, or Double Li. I can take my parents to LTH and get them purring about how much better their renditions of Cantonese classics are than anyplace they grew up with or out there now, and then knock their socks off with the crabs or clams or XO ribs. I needed to be shown how to do it, but that's one of the whole points of this site, isn't it? I moved to Chicago nine years ago, and somehow, on my first venture into Chinatown, I was drawn into "Little" Three Happiness. Egg Foo Yung, with old school cornstarch thickened gravy, perfect for spooning over rice. Snails in black bean sauce. I'll sit for as long as it takes to extract every last snail from the shell with a toothpick. Extra napkins please. Salt and pepper chicken wings. Crispy, gnarly bits of chicken, skin and cartilage, accented with onion and jalapeno. Salt and pepper pork chops. Same treatment as the chicken but a sweeter batter/breading. The sweet and sour pork spareribs from the "dim sum" menu. The fried oyster appetizer and some of the best Singapore noodles in town. I enthusiastically support the re-nomination of "Little" Three Happiness as a GNR. With the oncoming GNR renewals approaching, I've made a point to go back and revisit some of recipients up for renewal. Based on the meal I had last pm @ LTH, I couldn't imagine this restaurant not being a top contender for GNR status. That's not to say the the menu doesn't need to be studied and chosen from judiciously, but when you hit one of the many dishes they do that grabs you full tilt boogie, how can you think anything but? Like many, I've had my issues here, but by and large for this style of Comfort Cantonese, the winners outshine the also rans considerably. Sticking to Gary or Ronnies above mentioned anointed dishes will create smiles and full belly's all around. It's still as good as it was when the founding father's created the namesake forum we all hold so dear and take personal ownership in. LTH meets all the criteria for continued GNR status and should be a no brainer for renewal. I also strongly support "Little" Three Happiness receiving another GNR. LTH is "the" Chinatown spot for myself, Thor and Thor's Personal Assistant. The food is the best I have tasted in Chinatown, and the service is impeccable. We are always greated with a smile, and the staff always does its best to fulfill our wishes, whether it's to make the wide rice noodles extra crispy or to serve the shrimp toasts in a hurry when Thor is hungry. The only drawback to LTH is when the special Chili Oil is out--but that's not an issue with LTH itself but rather some large man wearing all black who's too damned lazy to replenish the supply. I'm looking forward to my next plate of crispy rice noodles right now -- I hope there's Chili Oil in the fridge when I get there. I fully support GNR renewal for 'Little' Three Happiness, the first GNR nominee and inspiration for LTHForum. My appreciation for 'L'TH has not faded one tiny shrimp head in the decades I have been going or 6-years since the original nomination. I've set an LTH dinner on October 5th at 7pm. Please see Events board. As I just posted on the events thread (but should have posted here instead), LTH definitely has my support for a GNR renewal. I would not mind it if a moderator chooses to move that post to this thread. I support renewal as well! I spend 60+ hours every week on my feet in a hot kitchen, fighting to provide a consistently excellent product to our club members. We hit the target mostly, but we do miss, for sure. I have experienced inconsistencies and flaws at some of my favorite places...La Taqueria Chapparita...Nuevo Leon...Top Notch Beefburger...even recently at Spiaggia, which was a $450 proice point for dinner for 2! There are reports of inconsistency at LTH and I have to admit that they are human and do make mistakes. It's happened to me...more than once. But I love this place and what they do, and also fully support the GNR renewal for Little Three Happiness, in spite of her flaws. It's tough to evaluate the namesake restaurant of this very forum, but this place is consistent as ever, and in the crowded GNR landscape of Chinatown, is usually my first choice. Through this forum, I discovered this place, and have taken many groups of friends and family down, all of whom have reactions ranging from: "this is pretty good" to "this is the best food I have ever eaten". To find a place with that consistent of a reaction among many eaters (picky, vegetarian, etc.) is quite impressive to me. My parents love the egg rolls and dumplings, and I in particular would likely include their salt and pepper shrimp in my last meal. To summarize: hasn't changed, is still a GNR pumping out great food and a great vibe.